New year according to the Hindu calendar is celebrated in different ways across India. In Maharashtra, it is called Gudi Padwa, Ugadi in Andhra Pradesh and Telangana and Yugadi in Karnataka. According to lunisolar calendar, Ugadi and Gudi Padwa are celebrated in the month of Chaitra marking the beginning of Chaitra Navratri, that lead up to Ram Navami People come together to celebrate this day and with great enthusiasm and fun. 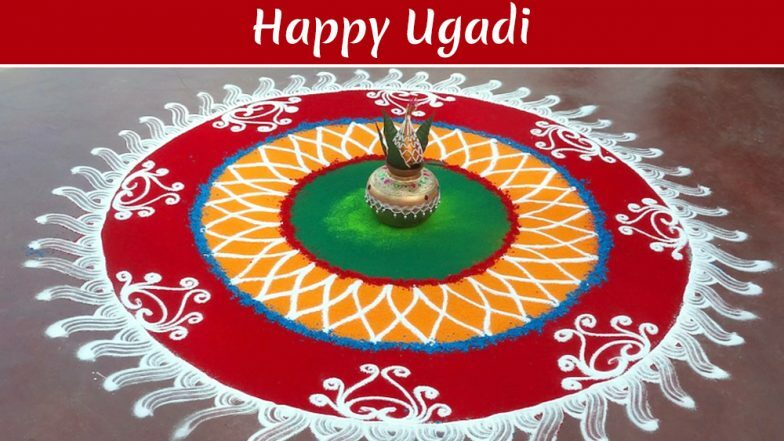 Ugadi aka the New Year's Day is the first day of the Hindu lunisolar calendar month of Chaitra and usually falls in March or April of the Gregorian calendar. People celebrating Ugadi decorate their doors with mango leaf decorations called toranalu or Torana in Kannada. Ugadi 2019: From Obbattu to Ugadi Pachadi Here Are Traditional Recipes From Andhra Pradesh, Telangana and Karnataka to Celebrate New Year. They also have a special bath, after which oil is applied to the body. Apart from this another essential ritual of Ugadi is to decorate your place with kolamulus which is very similar to rangoli that is made. It makes your house look colourful and signifies happiness. Kolam or muggu is an ancient art form of India which is very popular and it is also called rangoli. Another important part of Ugadi celebration is pachadi which is a concoction of six ingredients that is consumed on the day of Ugadi. Pachadi has a vital significance that symbolises different emotions we have in life like neem buds/ flowers for sadness, jaggery for happiness, green chilli for anger, salt for fear, tamarind for disgust and unripened mango for surprise.